عیسی زاده, نیکزاد, برزگران, مهران, رحمانیان, وحید, دلاوری, سمانه, مرزبان, آمنه. (1397). رابطه نگرش مذهبی با رفتار تغذیه ای در دانش آموزان دبیرستانی شهرستان زرین دشت. طب و تزکیه, 27(ویژنامه علوم انسانی سلامت), 23-33. نیکزاد عیسی زاده; مهران برزگران; وحید رحمانیان; سمانه دلاوری; آمنه مرزبان. "رابطه نگرش مذهبی با رفتار تغذیه ای در دانش آموزان دبیرستانی شهرستان زرین دشت". طب و تزکیه, 27, ویژنامه علوم انسانی سلامت, 1397, 23-33. عیسی زاده, نیکزاد, برزگران, مهران, رحمانیان, وحید, دلاوری, سمانه, مرزبان, آمنه. (1397). 'رابطه نگرش مذهبی با رفتار تغذیه ای در دانش آموزان دبیرستانی شهرستان زرین دشت', طب و تزکیه, 27(ویژنامه علوم انسانی سلامت), pp. 23-33. عیسی زاده, نیکزاد, برزگران, مهران, رحمانیان, وحید, دلاوری, سمانه, مرزبان, آمنه. رابطه نگرش مذهبی با رفتار تغذیه ای در دانش آموزان دبیرستانی شهرستان زرین دشت. طب و تزکیه, 1397; 27(ویژنامه علوم انسانی سلامت): 23-33. زمینه و هدف: تغذیه از جمله عوامل دخیل در تأمین سلامت و ایجاد بیماری است. به طوری که ارتباط تغذیه و رفتار تغذیه ای باسلامت افراد جامعه مورد تأیید و تاکید است. این مطالعه با هدف بررسی رابطه نگرش مذهبی با رفتار تغذیه ای در دانش آموزان دبیرستانی شهرستان زرین دشت انجام گرفت. روش بررسی: این مطالعه مقطعی تحلیلی در سال 1397 صورت گرفت. 800 نفر (400دختر و 400پسر) به روش نمونه گیری بصورت تصادفی و به نسبت تعداد دانشجوی هر مدرسه انتخاب شدند. ابزار جمع آوری داده ها پرسشنامه اطلاعات دموگرافیک و سنجه ی دینداری سراج زاده و رفتار تغذیه ای بود. داده ها در نرم افزار SPSS24 با استفاده از آمار توصیفی و آزمون های تی تست مستقل، آنوا و ضریب همبستگی پیرسون تجزیه و تحلیل شد. یافته ها: به ترتیب میانگین و انحراف معیار نمره نگرش مذهبی و رفتار تغذیه ای دانش آموزان 92/7±12/74 و 52/26±4/70 بود. نتایج نشان داد بین نمره نگرش مذهبی و رفتار تغذیه ای دانش آموزان همبستگی مثبت و معناداری وجود دارد(01/0 P=و 81/0R=). همچنین بین متغیر جنس با نگرش مذهبی (00/0) و رفتار تغذیه ای (02/0) رابطه آماری معنی داری مشاهده شد. نتیجه گیری: با توجه به ارتباط نگرش مذهبی با رفتار تغذیه ای، مسئولین سازمان آموزش و پرورش باید در جهت تقویت جاذبه های دینی و نگرش مذهبی دانش آموزان تلاش نمایند و همچنین در آموزش های تغذیه بر جنبه های مذهبی و اسلامی آن توجه نمایند. 1Associate Professor of Research Center of the Quran, Hadith and Medicine, Tehran University of Medical Sciences, Tehran, Iran. Background and objective: Nutrition is one of the most important factors in health and disease. relationship between nutrition and nutritional behavior is confirmed and emphasized by the people of the community. The aim of this study was to investigate the relationship between religious attitude and nutritional behavior in high school students in Zarrin-Dasht. Methods: This analytical cross-sectional study was conducted in 2018. A total of 800 (400 girls and 400 boys) were selected randomly and in proportion to the number of students in each school. Data gathering tool were demographic questionnaire, Serajzadeh religiosity measures and a researcher-made nutritional behavior questionnaire. Data were analyzed by SPSS24 using descriptive statistics, independent t-test, ANOVA and Pearson correlation coefficient. Results: Mean and standard deviation of religious attitude and nutritional behavior of students were 74.12 ± 7.92 and 70.26 ± 4.52, respectively. The results showed a positive and significant correlation between religious attitude and nutritional behavior of students (P = 0.01 and R = 0.78). Also, there was a significant relationship between gender variable with religious attitude (0/00) and nutritional behavior (0/02). Conclusion: Regarding the relationship between religious attitude and nutritional behavior, Officials of the Education Organization should strengthen the religious attractions and religious attitudes of students and also pay attention to religious and Islamic aspects in nutrition education. 3. Greene GW, Lofgren I, Paulin C, Greaney ML, Clark PG. Differences in psychosocial and behavioral variables by dietary screening tool risk category in older adults. Journal of the Academy of Nutrition and Dietetics. 2018;118(1):110-7. 4. 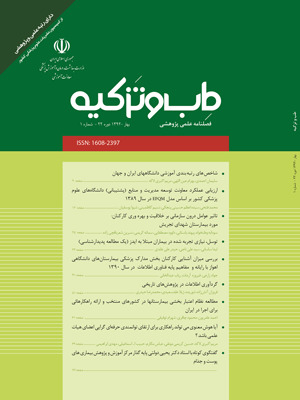 Derakhshan Z, Mahvi AH, Faramarzian M, Dehghani M, Salari M, Fakhri Y, et al. Data on heavy metal concentration in common carp fish consumed in Shiraz, Iran. Data in brief. 2018;21:1890-4. 6. Porto-Arias JJ, Lorenzo T, Lamas A, Regal P, Cardelle-Cobas A, Cepeda A. Food patterns and nutritional assessment in Galician university students. Journal of physiology and biochemistry. 2018;74(1):119-26. 8. Williams Jr RD, Housman JM, Woolsey CL, Sather TE. High-risk driving behaviors among 12th grade students: differences between alcohol-only and alcohol mixed with energy drink users. Substance use & misuse. 2018;53(1):137-42. 9. Green K, Smith A, Roberts K. Young people and lifelong participation in sport and physical activity: a sociological perspective on contemporary physical education programmes in England and Wales. Leisure Studies. 2005;24(1):27-43. 10. Christoph MJ, Loth KA, Eisenberg ME, Haynos AF, Larson N, Neumark-Sztainer D. Nutrition facts use in relation to eating behaviors and healthy and unhealthy weight control behaviors. Journal of nutrition education and behavior. 2018;50(3):267-74. e1. 12. Ismaeel A, Weems S, Ellor JW, Crow J, Myers D, Dolan S, et al. Association Between Negative Emotional States and Unhealthy Nutritional Behaviors in Soldiers. Military Behavioral Health. 2018;6(1):66-74. 25. Pilkington Geoffrey W, Poppleton Pamela K, Robertshaw Gillian. Changes in religious attitude and practices among students during university degree courses. British Journal of Educational Psychology. 1965;35(2):150-7. 26. Stark R. Physiology and faith: Addressing the “universal” gender difference in religious commitment. Journal for the Scientific Study of Religion. 2002;41(3):495-507.